Anna Cherer (LA ROCHELLE, France) on 17 March 2009 in Landscape & Rural and Portfolio. J'adore.... la lumière est très belle ici ! Quelle merveilleuse lumière sur ce beau petit ruisseau qui coule entre les pierres faisant comme un joli petit bain moussant! Tu as su très bien le saisir! Bravo mon april girl, gros bisous!!!!! Elle n'en finira jamais dans sa course folle! j'aime cette brume qui se faufile entre les pierres du ruisseau! la lumière éclabousse un peu plus! Superbe!!! J'aime entendre ta photo !! On entend presque le chant de l'eau qui tourbillone autour des rochers ! Il ne manque que le son a ta photo' mais on l'imagine facilememt. Joli cadrage. Bonne journee. Beautiful action in the water. I love the light on the rapids. What a stunning shot! Well seen and photographed. Marvelous! 1/8 sec. was perfect for this shot. Exquisite light. @john4jack: Thanks Jack ! you're the first to notice exifs ;-) it was not easy without tripod and filter, in afternoon with bright light ! 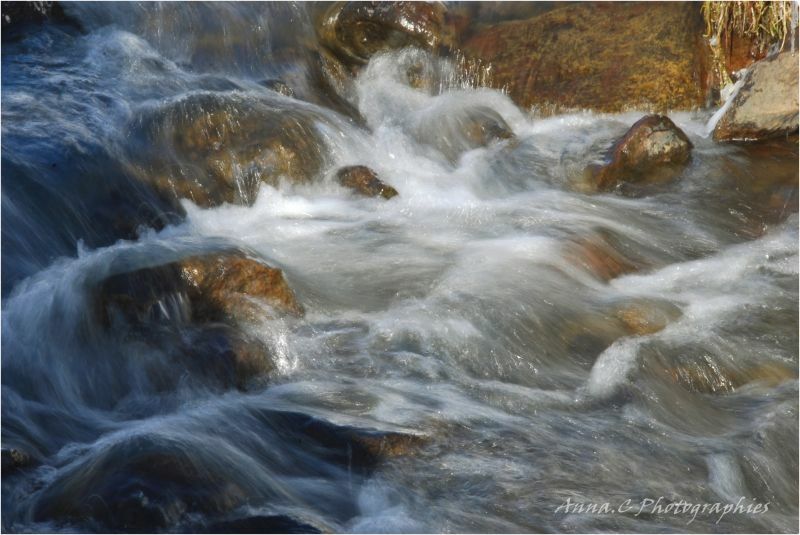 Lovely movement in the silky water. I like the light in this lovely image. Paisible comme tout à regarder... Ça sent le printemps !!! Love the 1/8 sec. seems perfect for this water. Without tripod and filter; Wow! ; amazing! I surely could not have done it. PS - upon another look, I think that no tripod, especially, contributed to the artistic quality of the photograph. @john4jack: maybe your're right ! I tried about ten shots and more before got one or two acceptable ;-) Thanks for all Jack ! @Howard F.: hi ! hi......Try again Howard ! don't give up ;-) thanks for all your kind comments !